iFlightPlanner for iPad v2.1 is "Cleared as filed!" iFlightPlanner for iPad v2.1, the second major update this month to iFlightPlanner for iPad presented by Sennheiser, is now available on the App Store! Featured in this release are several all-new features that were the direct result of feedback the iFlightPlanner Crew received from attendees at SUN 'n FUN just a few weeks ago; namely recently issued ATC routes, range rings, extended runway centerlines and pages from the FAA's printed Airport/Facility Directories. Recently Issued ATC Routes, "Cleared as filed..."
Routes issued by ATC within the past thirty (30) days are now available as a routing type in iFlightPlanner for iPad. Simply select "Recent ATC Route" as your routing method to view a list of routes that you are likely to receive clearance for. In addition to the routing, you'll see the number of times that route has been issued, the date and time of last issuance and its altitude range! Range rings and extended runway centerlines are now available as map overlays in iFlightPlanner for iPad. Just tap the overlays button at the top right of the map view to toggle them on/off. Range Rings will automatically size based on your current zoom level and runway extensions will be visible for any airports that are part of your current route at appropriate zoom levels. In conjunction with the FAA's recently updated Sectional chart format the iFlightPlanner Crew completely redeveloped its proprietary chart processing software, resulting in higher resolution and more accurate georeferencing. The enhanced chart imagery for Sectionals and TACs will be released with the May 1, 2014 data cycle! The official Airport/Facility Directory pages from the FAA's infamous "Green Books" are now available as part of the Airport Diagrams download in iFlightPlanner for iPad. For all airports that are listed in the FAA's printed A/FD, the PDF of that page will be the first document available on the Documents & Frequencies section of the Airports tab. By popular request, we've added a transparent white circle around the aircraft location icon and a pulsing blue ring to increase the visibility of your location on the map view in iFlightPlanner for iPad. 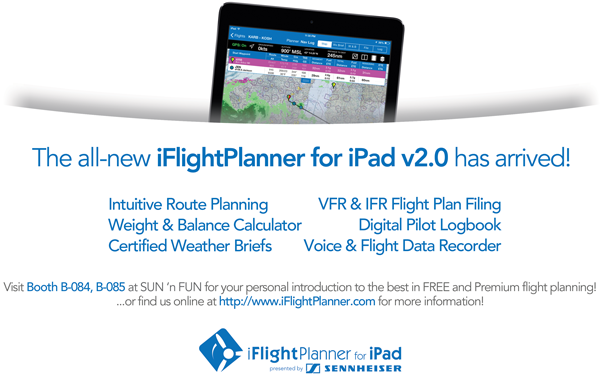 The all-new iFlightPlanner for iPad v2.0 has arrived! IMC Club International has launched an IFR Airport Practical Tips Reference Base, a library of a “real life experiences” about arrival and departure to the nation’s busiest and most challenging airports like Boston Logan International, Los Angeles, or Teterboro, N.J., as well as rural airports. All posts are based on actual experiences of the pilots. They will be checked, but not verified or endorsed by the IMC Club. They will be placed in a searchable database. This practical resource will be available for use by IMC Club members and other non-profit charitable aviation organizations to help their volunteer pilots plan and execute their charitable flights. "It is exciting to bring a great training opportunity like IMC Clubs to Wisconsin's Fox Valley, because instrument pilots and students from this area have had few opportunities before now. With the support of EAA, we hope the Fox Valley IMC Club will become a regular part of many IFR pilots' schedules." – said Mr. Miller - "We intend to use the inaugural meeting to determine our regular meeting schedule, and weigh the benefits of meeting in EAA's tremendous facilities against the advantage of rotating meeting locations across the Fox Valley." 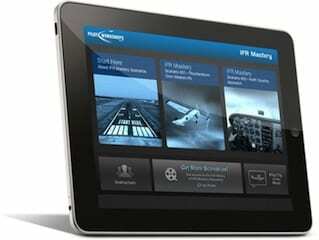 PilotWorkshops.com has announced the release of its new IFR scenario-based training app for the iPad. Called “IFR Mastery,” the free app provides two IFR scenarios based on PilotWorkshops’ IFR Mastery online training. Within the app, pilots watch a video that sets the stage by putting them in a real, challenging IFR flight situation. After watching the video, pilots are presented with multiple options and relevant resources to help them decide which course of action to take. The pilot commits to their decision via a poll and immediately sees how their decision compares with thousands of other pilots.